Cast Iron Wok Pans offer excellent cooking behavior, optimal heat conduction and a durable surface that will last a lifetime. 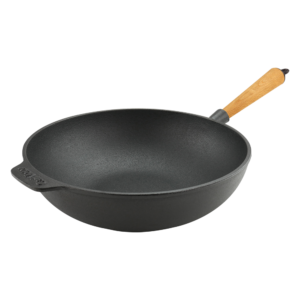 Also, the natural non-stick effect, which forms on these pans over time, without any chemical coating, is appreciated by chefs around the world. Carl Victor stands for Swedish know-how and design, made in one of the most modern iron foundries. Every Carl Victor product is made by hand, and then seasoned with vegetable oil. Making them ready for immediate use at home. You can use the wok pans on all types of stoves – including on Induction. The quality handles are made of beech wood or stainless steel. Cleaning: only with hot water and brush, without detergent. Never in the dishwasher! 25 years cast iron warranty.